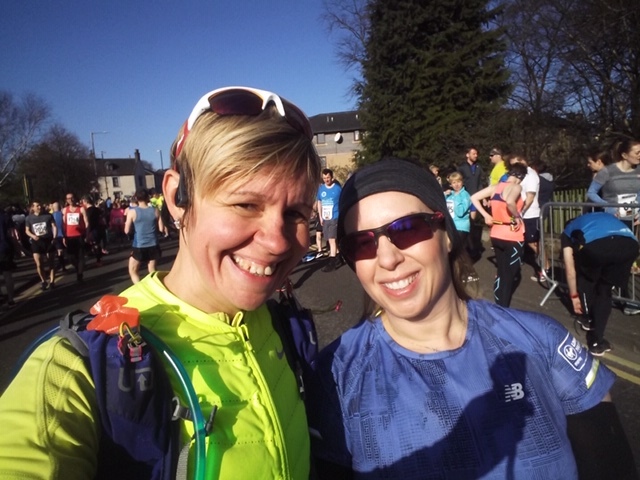 Today was due to be a lovely Spring day, ideal conditions for the Alloa Half Marathon (and quite a difference from this time last year when it was snowed off!). 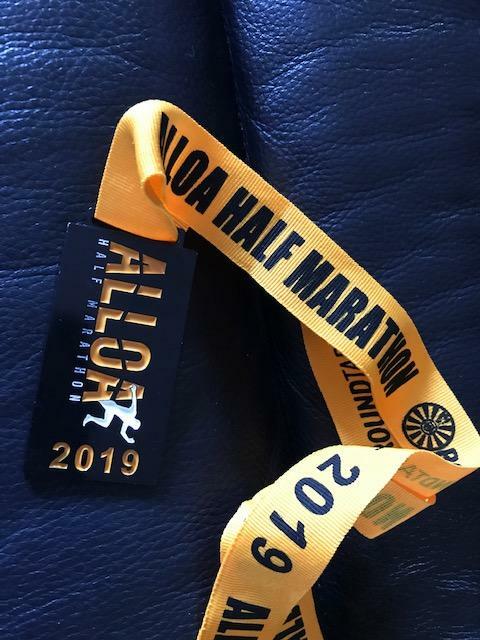 Audrey has run the race a few times and always said it was her favourite half marathon, so I decided to give it a go. And I’m glad I did. I picked up Audrey at 8am and drove the 45 mins through to Alloa and parked up. 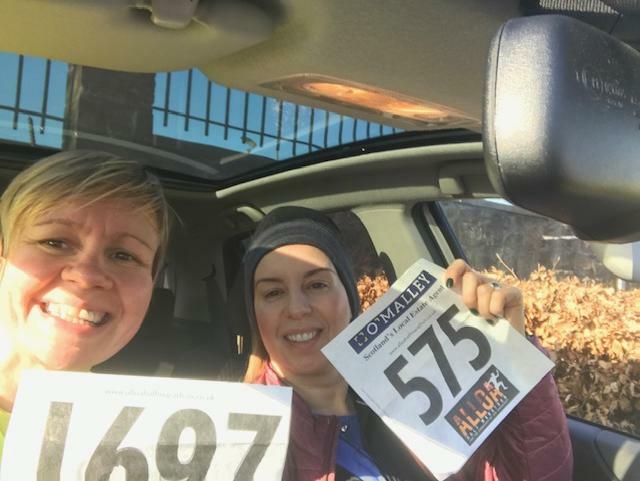 We went and got our numbers, went for a pre race pee… and got ready for the race. It was a short 5 minute walk to the start. School girl error number one was not tightening my water bladder to drink from, properly. This meant that the litre and a half I usually run with in my water pack, was reduce to maybe a third of that in the car on the way there. It had been chilling in the fridge (upright) overnight, and I didn’t notice it was leaking until I put it on, as it was lighter than normal and wet. So I filled it up with some water I had, and that would have to do. We stood not far from the start line for a bit and Audrey met some people she knows. Lucky Angela and Douglas (who is training for the London marathon). We chatted for a bit and Douglas went off for a pee before the start…something I realised after I started, that I should have done again too. School girl error number two… I realised as soon as I started running that I needed a pee. Like really needed a pee. Great fun. I must have drunk so much water with breakfast and on the way, that even with the first pee stop I needed another. I’ve been here when I did the D33, and 6 miles into a 4:30 run I stopped near a ditch, squatted down low and peed. 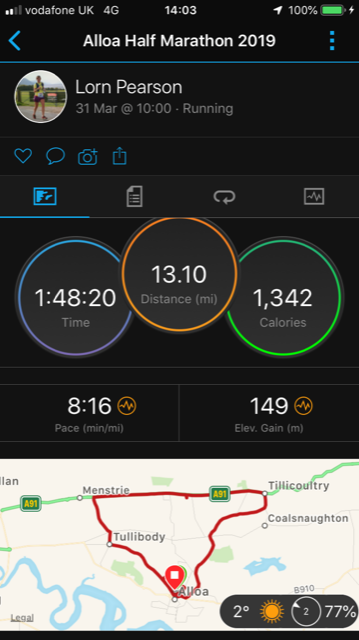 I didn’t really want to do it for this run as some of it was running through streets, so I hoped there would be a portaloo maybe 3 or 4 miles in…. no such luck. I tried not to let it get to me, but it meant that I wasn’t maybe focusing on much else. And I probably wasn’t pushing it as hard as I did in other halves. I noticed my heart rate seemed to be good, about 150-155 for about the first 2-3 miles and felt good (apart from wanting to pee myself!) 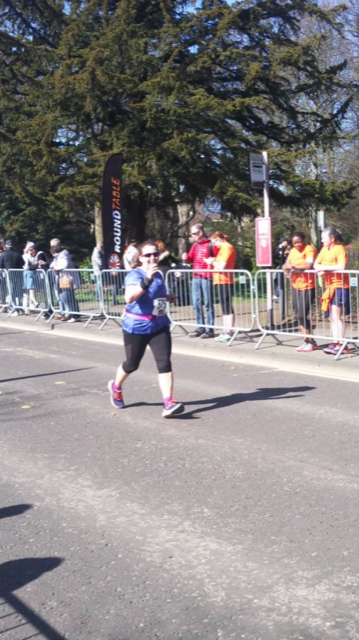 the conditions really were ideal – sunny and clear, cold, but warm to run in, and no wind. Audrey and a few others had told me about the hills – one about 3-4 miles in, one at 10 and another at 11. 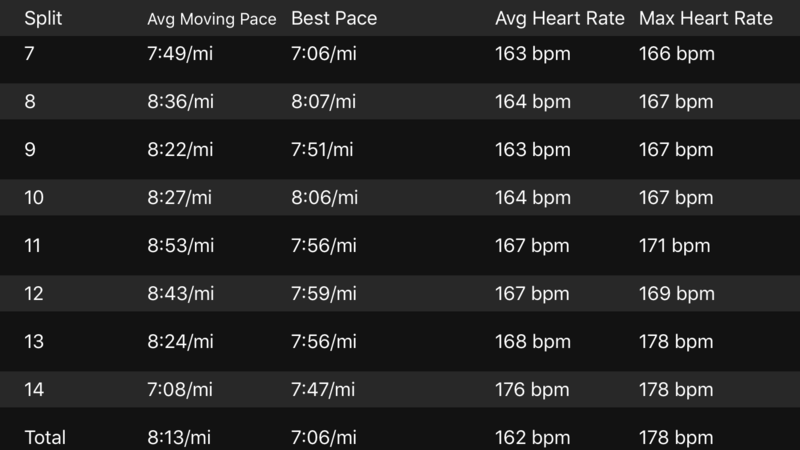 I figured if you climbed at mile 10 & 11 or lrobably meant you got a downhill near the end, and I was right … a steady wee downhill about mile 12. 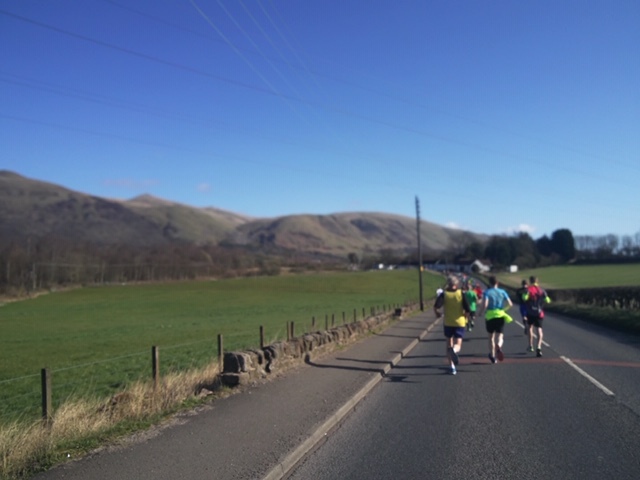 Even with the weather being chilly, in the sun it was warm, and I realised about 4 miles in that id done the opposite of Inverness with my clothes and worn too much. Capris should have been shorts, and I shouldn’t have worn my compression top, but could have got away with a vest or two. I also could have ditched my nike gillet (although I like it for the pockets). It didn’t harm me too much, but I must remember that in future for such ideal race conditions. 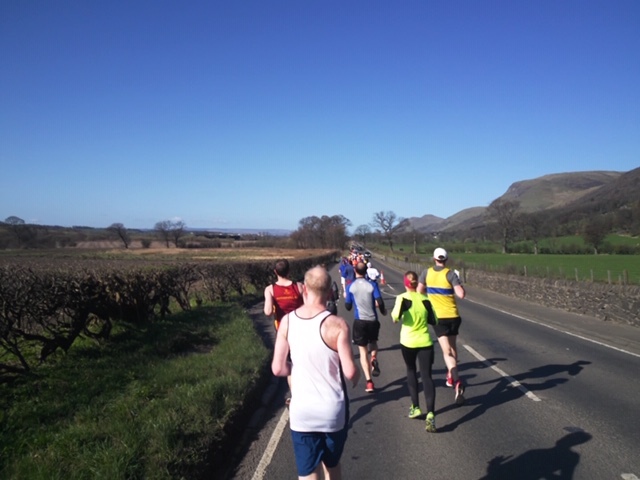 After the slight hill about mile 3 or 4, we came out of the town into lovely countryside scenery. There were a few slight downhills which seemed to help make it feel easy. 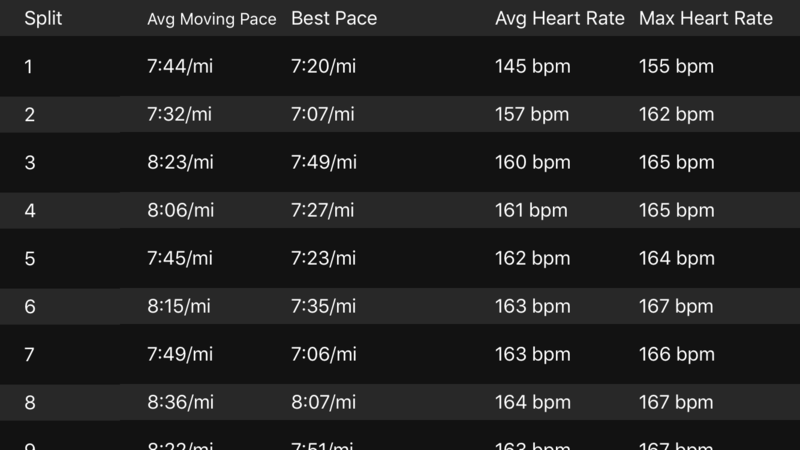 My average heart rate was between 145-162 for the first 6 miles, and I managed to do the first 10k in a reasonable (and fastest for a while) 49-50 minutes. I was feeling good. I’d taken on a pre workout mix before the run (more about that later, but it had 175g of caffeine in it and a number of other bits and pieces)… mixed with Greek yoghurt. Before I’d left my house I’d had some fruit and nut and a banana with some water. Then about 4 miles in I took my first (double espresso) caffeine gel (125mg caffeine). Then I had my second gel at about 8 miles in (cherry / 75mg caffeine). About 375mg of caffeine in total… that was plenty. 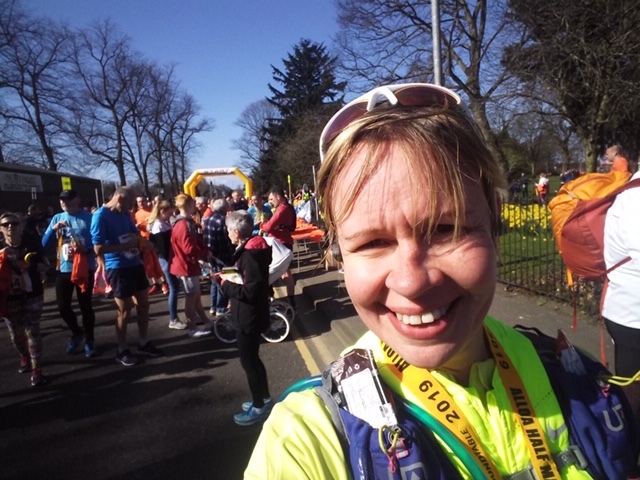 It did feel a bit like I was holding back the effort from going too hard for the first half, given my toilet situation, so maybe it was a good thing afterall. But I spent I don’t know how many miles looking for an inconspicuous place I could stop, squat and pee. I was even thinking that Paula does it, so I could too. Lol. It all seemed to work out well anyway. 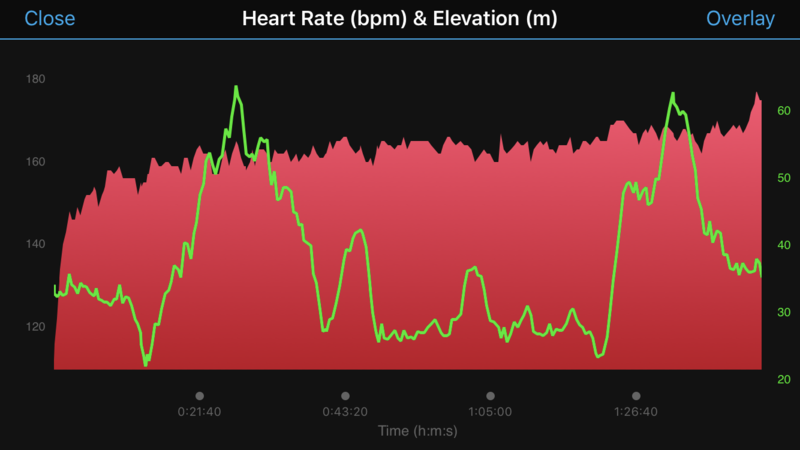 See my heart rate above, linked to my pace (which was mostly determined by the hills). I was feeling good throughout and paced myself up the last two hills. I kept an eye on my heart rate and eased off when it got to 170. Up and over the first hill at 10 miles, then the other at 11. At 2 miles to go I was at about 1:32, so figured I might finish in about 1:48… if I did about 2 x 8 min miles ish. 1.5 miles to go about it was about 12 minutes to go. This is what I do to occupy my brain towards the end – maths. For the last mile or so I pushed on strong, Managing 8:24 pace, then 7:08 min mile for the last 0.1. The finish was well sign posted and I crossed the line in just over 1:48. The difference between three weeks ago at Inverness was so much – today felt so much easier in body and mind, and it was probably mainly due to the conditions. And maybe the rest I’d had before race day (plus a different route). After I went back to my car at Asda and peed the longest pee ever, then got changed, had a chocolate forgoodness shakes and some water and did some stretches. Then I went back to the finish line to see Audrey and some others come in. We drove back then later on I went out for a fillet steak and sweet potato fries, with a starter of a prawn cocktail. 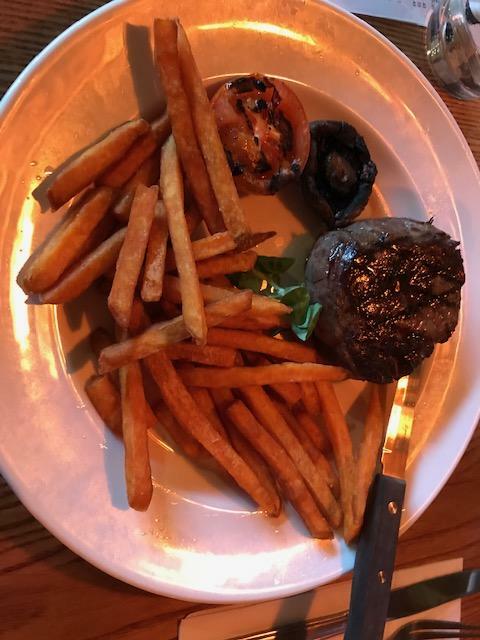 Ideal recovery food. But I refrained from having a pudding for once! 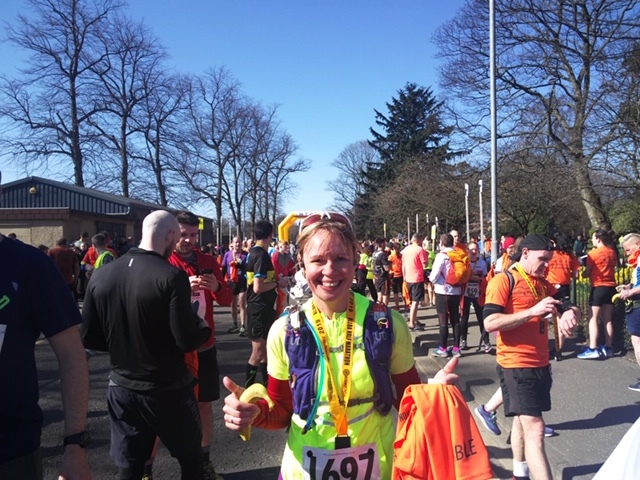 Here’s me at the end, happy with a good event, even despite the school girl errors (oh and I left the front door wide open when I left at 750am too!! Oops – inside door closed). 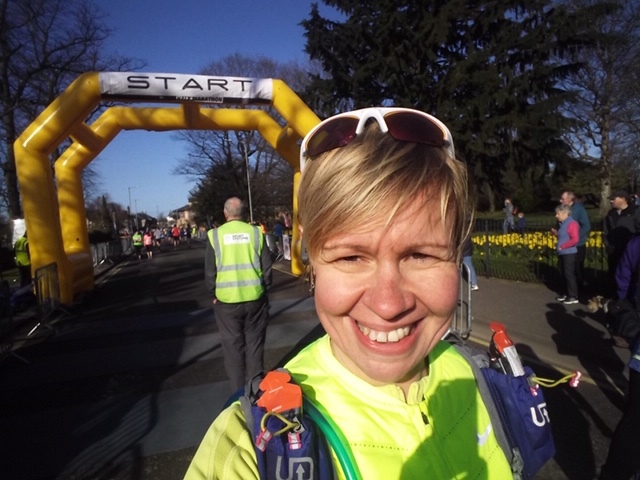 If you fancy a good scenic half marathon to do, I’d definitely recommend this one. A well organised and commentated event, simple and caters well for the 3-4000 runners who do it. The only feedback I’d have is that it’d be good for them to have more portaloos, maybe at 3-4, 7 and 10 miles in. I would have probably gone at 4 miles in, but after an hour of holding it in, I decided I could hold it in for another 50 minutes or so. Ouch. Nice medal and T-shirt. All good anyway. Now it’s a rest day tomorrow before going back to work on Tuesday and continuing my strength training and 10 week 10k training plan. After a couple of big sleeps hopefully.